Earth Day is upon us, and many teachers are putting the finishing touches on their “Earth Week” lesson plans. One of the more popular tools to educate students is to create an Earth Day quiz. Legends of Learning has two ways to make that easy for teachers. The Legends of Learning Platform allows teachers to better find the specific type of content they prefer. Question games, ideal for testing knowledge, are marked with the letter Q. Instructional games, which help students achieve content mastery, are denoted by the letter I. 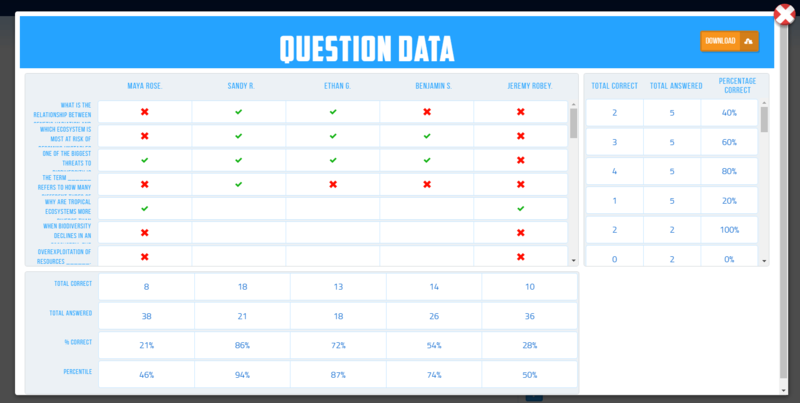 So if you want a Question game, simply find the topic you will be teaching in our system and look for the Q games. You’ll notice that games are rated by both teachers and students to help you find the best game possible, based on quality of instruction and how much fun they are for students. Also, teacher reviews offer further insights on how best to use the games. You can offer your students multiple Q games in a single playlist (tips on building playlists here). If you prefer to complement games with an Earth Day quiz, or you don’t want to launch a game at all, you can use our assessments feature. Assessments let you add a specific number of questions as an exercise for students. The questions are drawn from our teacher-vetted library of assessment items, aligned to standard science curricula like NGSS, GSE, SOL, and TEKS. You can add assessments either as a standalone playlist, before or after a game, or between games. Afterward, you can view student performance data (and download it as a spreadsheet) by clicking the “Question Data” button. You can also see individual student and class-wide answers while the playlist is live, which lets you adapt your class time based on real-time performance. Also, make sure to check out our mega-resource guide with more than 150 Earth Day activities, games, ideas, and lesson plans.